A new report lays out why so many Americans are renting even though rents are rising nearly everywhere. 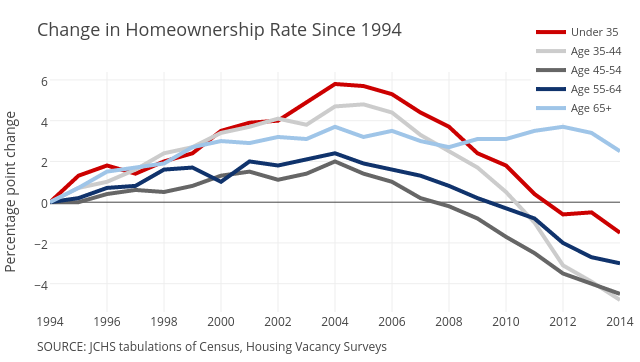 The decline of homeownership in America has persisted for about a decade, showing no signs of slowing down in recent years. Instead, more Americans are renting, often at prices they struggle to afford. A report published Wednesday by the Joint Center for Housing Studies of Harvard University highlights several key trends related to the housing market, many of which draw attention to the growing problem of housing affordability. The national homeownership rate fell to 63.7 percent in the first quarter of this year, the lowest level in two decades. Homeownership peaked around 2004 and has declined ever since, in part due to would-be homeowners facing mounting financial hurdles. Stagnant incomes and restricted access to financing also played a role in preventing people from owning houses, according to the report. The decline in homeownership has increased demand for rental housing. The study found that, between 2004 and 2014, the rental market experienced the strongest growth since the late 1980s. The move away from homeownership has not been confined to select regions of the country or a few demographic groups. Some attribute the shift to Millennials’ preference for renting. But homeownership rates have followed a steady downward trend across all age groups, with the exception of those over age 65. Householders between the ages of 45 and 64 accounted for roughly double the share of renter growth over the past decade than those under age 35, according to the report. Although homeownership has plummeted, rates would be even lower if it weren’t for the aging of baby boomers, as older Americans have historically owned property at high rates. The steady drop in homeownership hasn’t been limited to select regions of the country, either. Between 2006 and 2013, homeownership rates dipped in all but one of the nation’s 100 largest metro areas. Many areas with the largest shifts away from homeownership were hard hit in the bursting of the housing bubble, such as the Las Vegas-Henderson-Paradise, Nevada, and Phoenix-Mesa-Scottsdale, Ariz., metro areas. Pressures felt by homeowners and renters to pay housing costs are headed in opposite directions. Homeowners have benefited from low mortgage interest rates and foreclosures that helped pushed down prices. Both the number and share of cost-burdened homeowners -- those paying more than 30 percent of income on housing -- declined in recent years, accordingly. Meanwhile, more renters are coping with steadily rising costs. The latest 2013 Census estimates indicate that slightly less than half of all Americans who rent are cost burdened, setting a new record of nearly 21 million households. In 2014, rents climbed 3.2 percent, about twice the rate of inflation. One group that’s clearly under the most pressure to pay housing costs is, not surprisingly, low-income households. Just under half (48 percent) of households earning less than $30,000 a year spent more than half their income on housing costs, up from 43 percent in 2003. In many areas, there just isn’t enough affordable housing to meet the demand. The Harvard report found that 11.2 million U.S. households in the lowest income bracket competed for just 7.3 million housing units they could afford. But it’s not only the poorest households feeling the pinch. About 45 percent of rental households earning $30,000-$45,000 annually were cost burdened in 2013, up 7 percentage points from a decade ago. For households with incomes between $45,000 and $75,000, one-fifth were cost-burdened, up from just under 14 percent in 2003. The report notes that while federal funding for housing choice vouchers has increased, rising subsidy costs limited the number of households receiving assistance. The federal government has further cut funding for the HOME Investment Partnerships Program, which provides grants to states and local governments. In areas with the highest costs, the struggle to pay for housing is becoming more and more difficult for large segments of the population. The report highlighted cost burdens that are climbing the income ladder. In the nation’s top 10 priciest real estate markets 48 percent of households with incomes between $45,000 and $75,000 are cost burdened (this compares to 22 percent nationally). The Miami-Fort Lauderdale-West Palm Beach, Fla., metro area had the highest share of cost-burdened households in 2013, followed by San Antonio-New Braunfels, Texas. See an interactive map released with the report for more detailed data for each area.